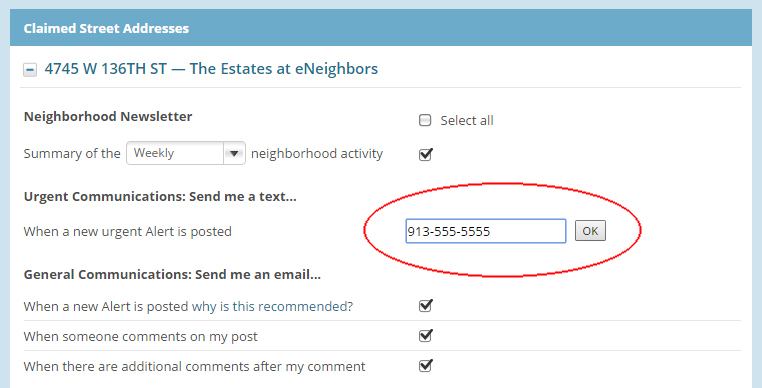 eNeighbors Text Alerts are available to all neighborhoods starting today and will enable urgent information like crime alerts to be distributed to the entire neighborhood instantly to subscriber’s mobile phones. If you’re a resident in one of our neighborhoods, please take a minute to subscribe to text alerts in your community to make sure that you’re kept in the loop. To sign up, go to your notification preferences page and check the box next to “When a new urgent Alert is posted”. Then enter your phone number and click OK. A confirmation text message will be sent to your phone to verify that we have the correct number. If you’ve already added your mobile phone number to the resident directory, we will send you a text message in the next few days asking if you’d like to sign up. Just reply ‘Yes’ to sign up. Please note that standard messaging rates apply. Questions? Please email support@eneighbors.com for help.